A repost:times gone by, when my son’s favourite toy used to sprout legs and walk to unspecified locations to fox us all. Between me, you and the gatepost, Bumpy is still very much in evidence today. My son lies upstairs, bereft. His lifetime long-nosed companion, Bumpy the Elephant, he who graced his cot and marches with him through life: he has once again gone Absent Without Leave. A few nights ago I spent many fruitless minutes rooting under sofas, behind cabinets and in toyboxes to no avail. He finally materialised, stuffed by the paper-cutter next to the telly in the middle sitting room. Once we feared we had lost him irrevocably. But no: he turned up, the bizarre product of a Narnian game the children had been playing in one of our cavernous wardrobes. Six weeks after his mysterious disappearance, there we found him, in among the camphor balls and well-pressed suits, looking for a lamp-post that wasn’t there. Bumpy has disappeared on more occasions than my slightly challenged long-term memory can keep track of. The tension when he is missing is taut, relief when we find him once again palpable. Seven-year-old little boys need their comfort toys. Tonight, Felix walked in just before bedtime and announced that Bumpy was missing. His face fell and he desperately attempted to bluster, but I could tell he was really quite upset. I followed his headlong dramatic Bumpyless dash upstairs and sat talking to the small miserable mountain beneath the duvet for some minutes. While I did not lecture my son I could perceive, loud and clear, something underlying his words: a way of thinking which I keep close to my heart, and tucked in my purse, and at the front of my mind most of the time. It is called ‘Locus of Control’. Rotter by name, but not by nature: Julian Rotter was born in 1916 and followed a classic academic’s path with a small spell advising the US army, finally settling at the University of Connecticut. From 1954 onwards a stream of ground breaking theory began to emerge from Rotter’s research. It’s complicated: let us see if I can define it accurately without risking the ire of a thousand psychologists. And I may be one of those people who think stuff happens because events outside my control make it so: I blame other people, fate, and other stories. Alternatively, I may be one of those souls who believes what I do has a direct bearing on the stuff that happens. So: Felix’s locus of control – a sort of fulcrum, his perception of who, or what, steers the events in his life – may be external. 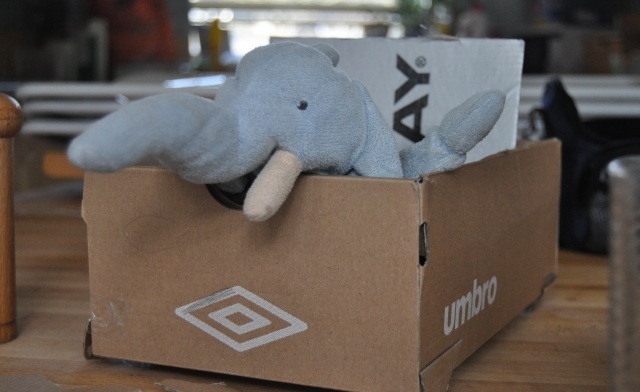 Felix may posit (if seven-year olds can posit) that his elephant is being controlled by contraband elephant smugglers, a parental conspiracy or The Borrowers. I watch my own locus of control like a hawk. I can be found stomping round the kitchen blaming Phil for the missing marmalade: but in most cases I was the culprit who stashed it in an original place. Listen. Just today. And I will wager you a cuddly elephant to a jar of marmalade that you hear that locus of control in action. My husband, whose locus is generally internal, has just rooted tirelessly. He is correct in assuming his actions have a direct effect on events around him. He has just found Bumpy wedged behind the toilet. Bumpy probably need what my keys have, a throne of his own. A stable place of importance that can’t move around on its own. One that everyone, including the Borrowers knows is his rightful place. That way you will reduce by at least 10% the number of times he goes missing. My locus of control is me, my locus of blame is everyone else. Simple really. A Bumpy-throne. Hmm. You have set me thinking, Sidey. wonderful, gold with red velvet cushions? I think that sounds splendid. It’s the moment of putting something somewhere that is all important. Either I put it down and think ‘I’ll remember where that is’ or my thought is ‘Hmm, will I remember where that is’? Guess which one is lost……. 😀 I have similar doubts about my own, Roger. We’ll blame it on the supernatural, shall we? Capital. Like it! Finding lost stuff is something I am good at- I just believe it has got to be somewhere. Yesterday I found granddaughter2’s missing music theory book ( after she and mum had searched and decided she had to buy a new one). On top of the washing machine. Not as essential as Bumpy. Never give up! Three extremely important words when things get lost, Elspeth,thank you! Lovely post, Kate. A reminder to be mindful . . . not only of where we put our stuff, but of the thoughts we think. If we are not mindful, we fall into the trap of dealing with the world in an habitual way ~ instead of mindfully acting based on specific facts, we re-act based on past experiences. We can think, “SHE makes me so mad,” and step into the role of a victim being acted upon while allowing our angry thoughts to spiral out of control. Or we can think, “I choose not to be angry,” and refuse to relinquish our peace of mind as a result of the intentional and unintentional actions of others. It is: and that is the glory of life, Nancy. We can switch in an instant. And though I have days when that locus is as far away from the centre of me as an out of town shopping mall, there are other days when I choose right. And it makes me much more alive, I think. I agree, Kate! Being in the “driver’s seat” does make us feel more alive. My lot in life includes cohabitation with dear ones who are very neglectful of where they put things, when, or even why. As a result, I have developed the ability of subconsciously taking note. Not a good thing really. They just rely on me as result. And, should I not come up with the location of one of their possessions, I am utterly to blame. That sounds like a very good plan indeed, Debra. I shall follow suit. Bumpy is showing no sign of waning in his popularity, Patti. Felix’s father had a similar arrangement with a small panda. The whole locus of control thing presupposes that the happenings are within the control of something other than Bumpy. Has it occurred to you that your son is right, and Bumpy is personally going on walkabout at intervals and then Narnia or toilet visits are wrongly blamed? And now that I’ve got you a bit uneasy ……………………………………. Heehee. Thought that would make you jump. Thanks, Col. Somehow, I knew you’d come up with a new perspective on the situation. *snigger* Always happy to oblige! Bumpy. The ideal place, I suppose. A wise person once told me (Dr. Mario Rivera) “you don’t have problems, you are the problem” . I love that 🙂 And what about its inversion: “You are the solution”…. I am massively relieved that Bumby was wedged and not flushed. Between you and me, Lame, Bumpy has suffered a similarly watery fate in the past. But I had better not say more. There are things, replacements, remedies about which parents never, ever talk. Yes, I know hose secrets from my old childhood experience. I had a bear I literally loved to pieces I named Ted. Then, one day Ted looked different. He looked like Ted but not quite like Ted. I revised his name to New Ted. I know my bears Kate! I enjoyed this reread, Kate. Nice to read about Bumpy again, though still cringe a bit at where he was found. You’ve read The Velveteen Rabbit, haven’t you?